Thank you for the ticket purchase to SANTA ROSA, CA. in the year 1870. We just KNOW you’re going to enjoy your visit back then! Your costume will be arriving by drone shortly (DO NOT WASH OR HAVE CLEANED). Prior to departure from the atavachron station, the purser will issue you $ 52 in replica gold coins which will have the purchasing power of approximately $1,000 today. To make the most of your trip, it’s helpful to be as knowledgable as possible about local topics. As many events carry over from the previous year in your time window, our bots have prepared this overview of 1869-1870 by scanning a local newspaper, The Sonoma Democrat. Selected tips and advisories from previous time travelers are also included. TRAVEL ADVISORY Those with asthma or other respiratory difficulties should note that air quality will be very unhealthy to hazardous throughout Sonoma and Napa counties during the Great Fire, October 15-22 1870. GENERAL Santa Rosa is a frontier village on the cusp of becoming part of the greater San Francisco Bay Area. In the space of two dramatic weeks between October 15-31 1870, railroad service begins, the first streetlights appear and there will be fears that a wildfire is poised to destroy the town. Aside from the 1906 earthquake and the 2017 Tubbs fire, these are the most impactful days in Santa Rosa history. FROM CORY298: When the topic of Santa Rosa comes up in Petaluma, shake your head sadly, tsk-tsk or optionally chuckle; if Petaluma is mentioned in Santa Rosa, shake your fist and cuss. The population of Santa Rosa is about 1,800 with the overall Santa Rosa Township approx. 3,000. Petaluma, the other major community in the area, has around 4,500 residents. A significant rivalry between the towns began a dozen years earlier and in 1870 there will be a renewed call to split the county in half, with Petaluma intended to be the county seat for the southern section. You will be expected to express your feelings about this rivalry generally. 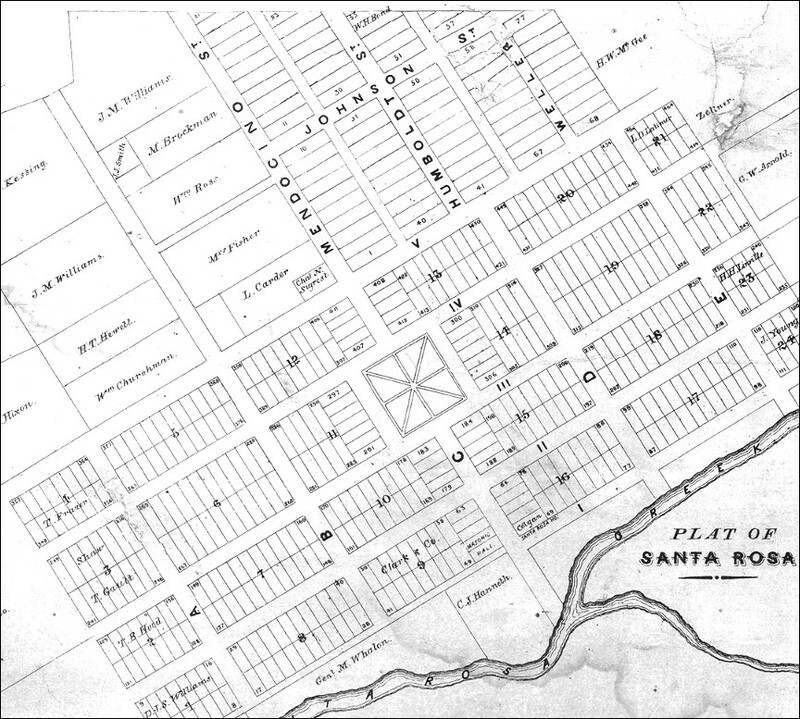 Santa Rosa is roughly 30 square blocks with an open plaza in the center (see 1866 map below). Salmon run in the adjacent Santa Rosa Creek, but the waterway is not navigable in 1869 due to obstructions from two buildings that collapsed into the creek bed. Small corn and wheat fields surround the village on the other three sides. Santa Rosa has no library, no bank (until November, 1870), no water, sewer, or gas utility services. TRAVEL San Francisco can be reached via steamboats/ferries departing from Petaluma/Vallejo. Stage coaches to those towns may not connect reliably with ship departure schedules, so an overnight layover may be required. All roads are unpaved and during rainy periods the Petaluma and Sebastopol road is sometimes nearly impassible. 1869: “…[there are] two or three swimming holes, almost deep enough to drown horse and rider.” 1870: “…[there are] lakes deep enough to admit of gondolizing upon their muddy surface.” When a stage becomes stuck in mud, all passengers are expected to assist in pushing it out. THE RAILROAD The train will not actually arrive in Santa Rosa until mid-March, 1871, but daily service begins Oct. 22 1870 as stages shuttle passengers back and forth from the downtown hotels to the terminal point of the approaching track (MORE details). The objective is to connect Santa Rosa to Petaluma immediately (preferably direct to its steamboat pier) with rail extensions further north to come in following years. Work is intermittent in 1869 due to the developer having financing and supply difficulties; by the end of the year there is only 1½ miles of track laid north of Petaluma. Since the rail line will eventually connect to the ferry in Sausalito, there is a widespread conspiracy theory that Petaluma is somehow responsible for the slow progress. Supposedly interests there wish to block or delay construction because a direct train connection to the Bay will lead to a dropoff in steamboat passenger and freight traffic. FROM RAILROADGUY-SF: The excursion departs San Francisco at 8:30AM and there will be no food, drinks or bathroom breaks until the party returns to the steamer at 5PM, so be prepared. A new developer takes over the project in August 1870 and work resumes swiftly. The first San Francisco excursion train to Santa Rosa is announced for December 31 and over 1,200 people will take the trip, riding open freight cars fitted with seats. Unfortunately the tracks terminate a mile south of Santa Rosa and the train will start its return to Petaluma an hour after it arrives at the end of the line. There will be only a few buggies and wagons waiting to transport visitors into Santa Rosa, so those wanting to visit the village will have to dash for it. As this is the most popular event in this venue, arrive early and please refrain from gambling on the running excursionists with other time travelers. POLITICS Avoid generally, but understand most in Santa Rosa still view everything through the prism of the Civil War. Sonoma county was one of the few places in the state which never voted for Lincoln, and Santa Rosa remains a hotbed for Confederacy sympathies in 1870. In Santa Rosa it is not the “Civil War” but the “War for Southern Independence.” The Democrat newspaper will regularly denounce the government as a fanatical mob of revolutionaries who have divided the nation and trampled on the Constitution. Travelers not on the women’s suffrage tour will be interested to know this venue includes a Jan. 21, 1870 lecture by nationally famous activist Laura de Force Gordon in Petaluma. Women’s suffrage is the main political topic in this time window, as Wyoming gives women the vote in December, 1869 and the 15th amendment is ratified as part of the Constitution in March, 1870, which grants citizens the right to vote regardless of race, but does not include women. Other names which will be heard mentioned on the subject include Anna E. Dickinson, arguing forcefully for women’s rights and considered one of the most eloquent speakers in the nation and Emma Webb, an actress who opposes suffrage (and also gave speeches in support of slavery during the Civil War). During 1869 there will be evening Lyceum debates over suffrage at the Santa Rosa courthouse in April (decision in favor suffrage) and May (decision against). There are no women participating in either debate. Trigger alert: Those wishing to avoid exposure to extreme misogyny should avoid reading coverage of these events in the Sonoma Democrat. THE GREAT FIRE The “Great Fire” of 1870 matches the pattern of the 20th century Hanly Fire and 21st century Tubbs Fire. It begins in the Calistoga/St. Helena area and burns through Knights Valley and the Mark West Creek watershed towards Santa Rosa, driven by high winds. On the night of October 16 the fire is three miles from the village and a collection is taken to pay three men to stay up all night and sound the alarm if needed. No lives are lost, but farms are destroyed with some livestock killed (MORE details). October 1869 will see the formation of Santa Rosa’s first Base Ball club, which will begin playing as soon as instruction books on the rules arrive from San Francisco. On December 4 they challenge any nine who show up at their field as long as they are residents of Santa Rosa. DRINKING Santa Rosa is already on its way to becoming a saloon town in 1870, with six bars in the village. There are breweries in Healdsburg and Petaluma but none in Santa Rosa. Isaac De Turk’s winery in Bennett Valley produces 6,000 gallons of wine, most or all of which is shipped to San Francisco. 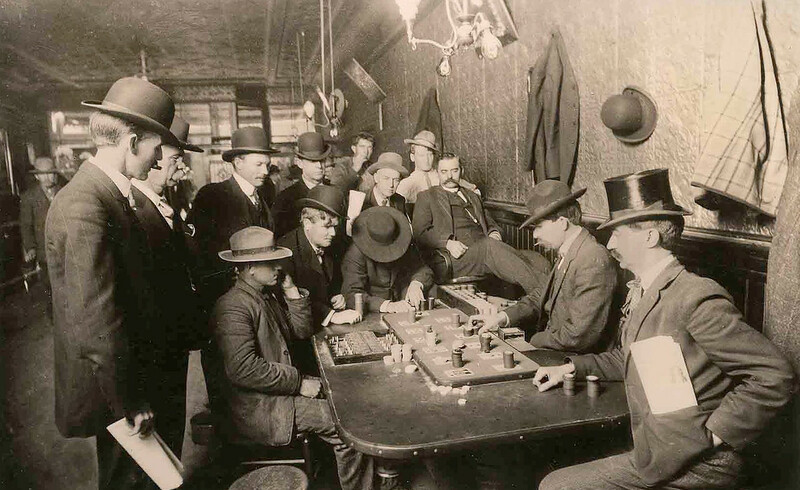 Card players should expect to play faro, which is by far the most popular game throughout the West until the early 20th century. It uses a regular deck of cards but suits don’t matter; just bet on any of the 13 ranks – a king, 4, etc. The “bank” deals two cards pushed up from a spring-loaded shoe as in blackjack. The first card turned over is the loser, and the second is the winner. It’s the simplest card game possible but every dealer has additional rules on betting. Faro is popular because it is fast moving and a social game like roulette, where there are often onlookers placing bets during the course of the game. Betting on the order of appearance for the final three cards remaining in the deck has the highest stakes. This card game is also famous for cheating. From an often reprinted 1882 booklet titled “Faro Exposed”: “…all regular faro players are reduced to poverty…almost every faro player has some peculiar system which he strives to believe will beat the bank, but in the end all systems fail.” For more on faro, see the comprehensive “Faro: A 19th-century gambling craze.” Other popular card games include monte-bank, chuck-for-luck, seven-and-a-half, keno and rondo. There is no temperance group in Santa Rosa akin to the Dashaway Associations of the early 1860s and the Blue Ribbon Clubs of the late 1870s. This will be a disappointment to experienced travelers who know those popular non-religious meetings are great opportunities to mingle with locals, find lodging and even employment, if desired. GAMBLING Wagering at card games is a preoccupation for many men, but caution is strongly urged. 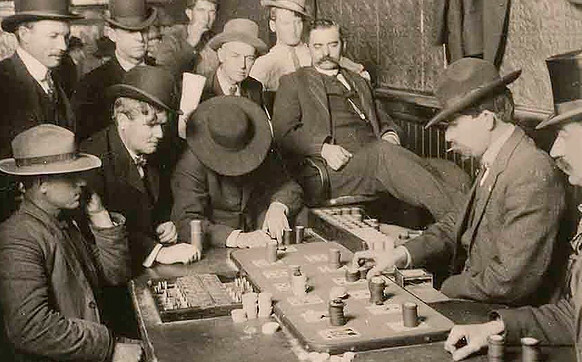 Violence can erupt over trivial gambling disputes, and in 1870 a man named Charles Coburn is stabbed repeatedly at a card game in Sebastopol. Also that year a man known only as Clark is stabbed in the neck at Santa Rosa’s Rialto saloon over cards. Travelers will not desire to experience emergency medical care in this time window. Depending upon the time of your arrival, there are any of six horse tracks in the vicinity: The Petaluma Race Course, the Santa Rosa race track, the Sotoyome Race Course near Healdsburg, Watson’s race track near Bodega, Gannon’s track at Sebastopol and the James Clark race track south of Santa Rosa. Having so many racing venues in the area is a point of local pride. A racing program consumes most of a day, including amateur scrub races and sometimes foot races. FROM TAILROTEEL: Bet on the raccoon. CHILDHOOD ACTIVITIES For travelers not part of the “Tom Sawyer” tour, expect to see lots of youths in 1870 Santa Rosa. There are 581 school age children (exactly one-third of Santa Rosa’s population) and the newspaper complains frequently about the lack of parental supervision. Besides gambling on scrub horse races on the Petaluma road, boys eight years old and younger are often seen riding at full gallop. Mobs of small boys roam the streets late at night, sometimes making a racket with homemade musical instruments. 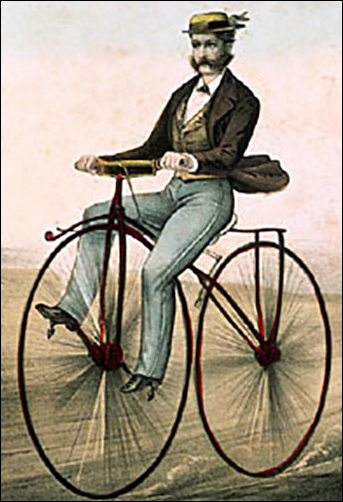 The 1869 velocipede fad is followed by 1870 stilt walking, with children wobbling around the main streets on stilts up to five feet high. Dear Editors — A large, intelligent and appreciative audience, last evening, listened to a most eloquent and cogent appeal on behalf of woman suffrage, by Mrs. Laura De Force Gordon. She showed most clearly the manifest injustice of a republican government in denying to one-half its citizens (?) no ! not citizens, but one half the people, the right to a voice in its laws. Women are taxed equally with men. They are alike amenable to law, yet are classed with criminals, idiots and pauper’s. Her argument on this head was unanswerable. She also showed in strong terms that women do want the ballot and that they will have it. Her last argument was clear and forcible as to their need of the ballot in regard to the care of themselves and their children in earning, owning and disposing of property. Mrs. Gordon is an exceedingly pleasing and interesting speaker and commands the entire attention of her audience. She was compelled, by press of engagements in San Francisco and vicinity, to postpone her lectures in Santa Rosa and Healdsburg until after the Woman Suffrage Convention which meets in San Francisco on Wednesdav next. We hope that Sonoma county will be largely represented and an interest awakened in this important subject.